От 2016 г. Теленор започва да прилага нова функционалност 4G мрежата за обединяване на два честотни спектъра 1800MHz и 2100MHz и я предлага за първи път на своите клиенти във Враца, Ловеч, Велико Търново и Пазарджик, както и в най-посещаваните български зимни курорти. През 2017 г. Теленор продължи да развива тази нова функционалност и в други населени места като Хасково, Плевен, Кърджали, Сливен, както и някои от летните курорти, а към края на 2017 г. тя вече бе налична и в София, Пловдив, Варна и Бургас. Към момента новата функционалност, напоследък така популярна като 4.5G, покрива 45 града, зимни и летни курорти и е налична в още 87 населени места и туристически дестинации в страната. Към май 2017г. 4G/LTE мрежата на Теленор за пренос на данни покрива над 700 километра или 95% от магистралите, както и над 2800 километра първокласни (95%) и повече от 3000 километра (77%) второкласни пътища в България.4G/LTE мрежата на Теленор обхваща 610 селища с население над 1000 жители и много други по-малки места, като над 200 от тях бяха добавени чрез разширение на покритието в края на 2017г. Към май 2017г. 4G/LTE мрежата на Теленор покрива 89.06% от населението на страната. 1. What is 4G/ LTE and what is the difference from 3G? As its name suggests, 4G/ LTE is a technology for transmitting data from fourth generation. This technology allows faster (compared to 3G) data transfer for uploading and downloadinginformation from the Internet. With 4G/ LTE you can pretty faster download an image, video or music from the Internet. Uploading files also goes faster in comparison with 3G. 2. What are the advantages of using 4G compared to 3G? If you are using Internet daily either for work or entertainment, 4G/ LTE will save you precious minutes. With the faster speed that this technology offers, you can work quickly and easily with bigger files attached; upload a photo in high resolution on social networks; or simply watch the latest video of your favorite band. 3. Can all Telenor customers freely use the 4G/ LTE? now you use mobile internet at the maximum attainable 4G/ LTE speed in the zone of 4G/ LTE coverage, in which you are being located. In all other cases, the usage of mobile internet is performed only through the Telenor's 2G/ 3G network and with a maximum attainable speed only according to 2G/ 3G network standard. .
*If you are a customer of a postpaid plan, upon next contract renewal, you can decide whether to continue using data traffic via the 4G/ LTE network as per the currently valid offers for using mobile internet through the 4G/ LTE network of Telenor. If you are a customer of Telenor prepaid plans and have been testing for free the 4G/ LTE network during the promotional period, you get an extension to use mobile internet on fast speed for data transmission of 4G/ LTE network, with no additional cost till 30.04.2016. 4. What should I do to use the 4G/ LTE? First, please make sure that your SIM card and your phone (or other mobile device) supports the 4G/ LTE technology. All customers who use the new Telenor's 3in1 SIM cards can take advantage of 4G/ LTE, because this type of cards is fully compatible with the new technology. However, if you want to check whether your SIM card supports 4G/ LTE, just send a free SMS with text "4G" to short number 144 and we will reply back with an answer, if you have to change your SIM card. To ensure that your phone or other device is compatible with 4G/ LTE , you can 123, visit a Telenor's shop or check the list of 4G/ LTE devices. The usage instructions of any mobile device, as well as manufacturer's websites and all other pages that show the features of mobile devices, indicate whether a device can work with 4G/ LTE technology. Once you have completed the steps above, and if you are in the coverage of 4G/ LTE, at the top of the screen of your mobile device, the 4G/ LTE indicator will appear as LTE or L. The indication depends on the operating system and model of the device you use. Once you've made those settings, there is no need to change them in order to use again 3G. Your phone will automatically switch to 3G or 2G, if no 4G/ LTE coverage available. 5. Where can I use 4G/ LTE? As of April 10th 2016 the service could be accessed in over 270 locations and is available for all private and business customers of Telenor who use mobile internet according to their respective plan. 6. Do I need to change my current plan in order to be able to use 4G/ LTE? Since the launch of its 4G/ LTE network, Telenor offers postpaid plans that include an access to 4G/ LTE network when using mobile Internet. 7. Will 4G/ LTE change the quality of voice calls? No, there will be no change in the quality of voice calls. 8. Do I have to pay more if I'm on 4G/ LTE? •After 01.02.2016 yousign a new 2-year contract under postpaid plan Standard, Nontop or Reserve with monthly fee of/ over 19.99 BGN. If you are a customer on postpaid plan you can continue using mobile internet over 4G/ LTE network Telenor for free with no additional cost till the expiration of your contract for mobile services. Upon next contract renewal you can decide whether to continue using data traffic via the 4G/ LTE network as per the currently valid offers for using mobile internet through the 4G/ LTE network of Telenor. If you are a customer of Telenor prepaid plans and have been testing for free the 4G/ LTE network during the promotional period, you get an extension to use mobile internet on fast speed for data transmission through 4G/ LTE network, with no additional cost till 30.04.2016. In all other cases, the usage of mobile internet is performed only through the Telenor's 2G/ 3G network and with a maximum attainable speed only according to 2G/ 3G network standard. 9. What is the speed in the 4G network? Telenor uses various frequency bands and bandwidths in order to increase its 4G/LTE Technology coverage. This may affect the maximum available speed, but also gives the opportunity to expand network coverage on the roads and in small settlements. Factors, such as quality of signal, simultaneous connection of many users and their distance from the cell, the type of mobile device, also can affect the user experience. 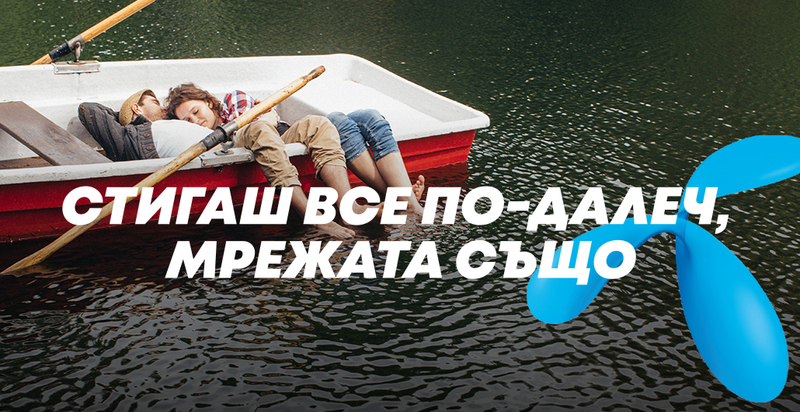 • 4G - Download до 100Mbps (LTE) Upload до 38Mbps (LTE). The above speed of the 4G network is estimated for coded physical channel in 15MHz bandwidth with minimal effects of the factors that affect the signal’s quality. When data is exchanged via the mobile network some system information necessary for the proper wireless transportation is added. This additional information does not account towards the customer consumption. The quality of the signal depends on the area type, the location and the buildings density, from your location in the building (for example underground rooms), from the model of your mobile phone, and from the network load. These and some additional factors can affect the reception quality.